A book that begins with a quotes from Carl Spackler, the eminent golfologist, philosopher and caddy, will get my attention and “LOOPERS: A Caddie’s Twenty-Year Golf Odyssey” did…and does. 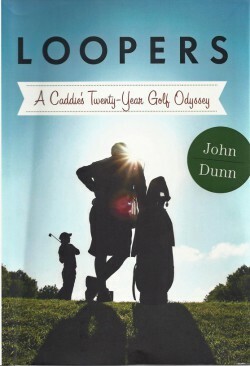 Author John Dunn tells of his two decades as a caddie or, in their vernacular, a looper, at some well known and not-so-well known courses such as Bandon Dunes, Sherwood Country Club and the Old Course at St. Andrews. But LOOPERS is more. Dunn shows the reader how a youngster learns to be an adult while sharing his thoughts and insights of the world of club caddies, and he is at his best writing the often pithy descriptions of his fellow loopers. Make no mistake, Dunn wasn’t carrying a bag until something better came along. He consciously made caddying a career, albeit not on the professional tours but private country clubs and resorts. He reveals, to no one’s surprise I’m sure, that club caddies are often running away from a previous life or are too fond of cards, horses, or in many cases are too fond of booze or drugs. It’s a harsh life, a hidden life from society – and usually the authorities since caddie fees are payable in cash. But at the same time there’s no retirement plan and Obamacare hasn’t reached them…yet. The one thing almost all the caddies depicted in “LOOPERS” have in common, is a love of the game and a burning desire for the out-of-doors with responsibilities commensurate to their lifestyle. That’s certainly not bad, but with equal certainty it is different than the lives the rest of us lead. Dunn found a vigorous and vital way of life which comes through clearly in his words. He caddies with no anticipation of wealth but at the same time it’s clear he knows of the job’s compensating values – walking through nature and playing golf courses, some of which are as beautiful as any place in the world.